We can debate about how long there has been a distinctive “California Sound,” but at the very latest that sound was born in November 1961 when the Beach Boys released their first single on Los Angeles radio stations KFOX and KDAY. The Beach Boys are ever the quintessential California band, and their recent reunion as septuagenarians was covered in an incredible piece by Newsweek’s Andrew Romano that read like it belonged in Rolling Stone. He goes on to offer a soft lament about the state of the music industry. There is a reason all these aging rock stars keep reuniting and touring: we keep shelling out for tickets. The Beach Boys are no exception. In 2011, Bon Jovi, U2, Take That, and Roger Waters topped the box-office charts with joint receipts of $821 million, and so far, 2012’s live bestseller list—Black Sabbath, Bruce Springsteen, Van Halen, Madonna—isn’t much fresher. Meanwhile, surveys suggest that the vast majority of all downloaded music is stolen, and album sales are half what they were at the turn of the century. We’re witnessing a massive shift in revenue from new recordings to live music—and in large part it’s live music that was originally released more than 20 years ago. The record industry is no longer a record industry. It’s a touring industry for geezers. There is some truth to this, but there is more to the industry than touring alter kackers. The music business is in the heart of a tempest caused by a change in technology and a change of habit. This has happened before, first with the growth of music publishing, then with recorded music, then with radio, and now with digital technology. A Western Grey Squirrel (Sciurus griseus) perches atop the highest branch in an oak tree in Lower Arroyo Sequit Canyon, easy prey for any hungry raptor who might be circling in the noontime sky. Even more strangely, the animal emits a loud squeak, almost a chirp, rhythmically, every second. It is a sound and a behavior none of us has ever heard. 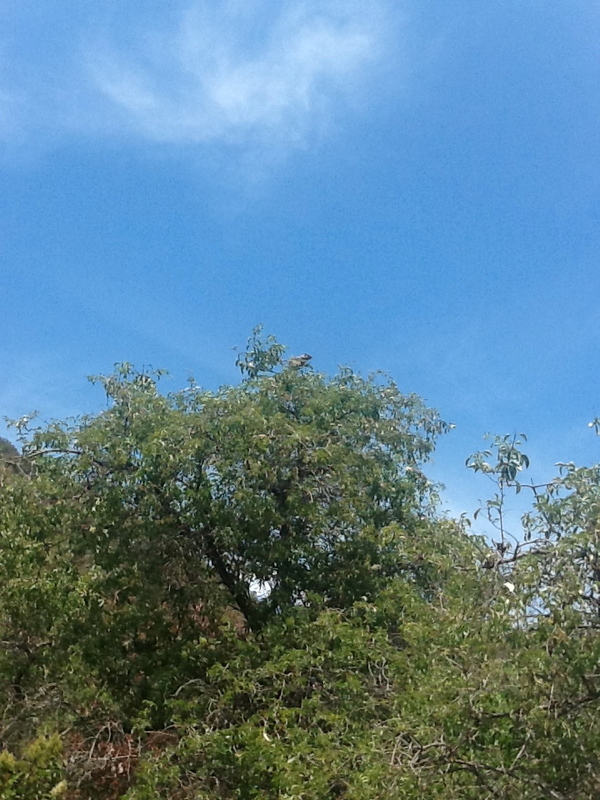 Looking more closely, we see the squirrel transfixed to our right, up the canyon a bit and toward the campground. Transfixed, we follow its gaze. Fifty meters up the canyon, in the midst of a gravel trail, lies the headless corpse of another squirrel, and the shocking revelation comes that what we are looking at is evidence of a family unit that has been violently broken, an automobile the most likely culprit. As we continue our hike up the canyons above Leo Carrillo State Beach, we see at least a dozen other squirrels on their daily rounds, likely gathering food to feed newborn broods hidden in the trees and underbrush. This is breeding season for the Western Grey, and moms (it is usually the moms for this species) are busy. The animals cross the paths and roads with little care, completely ignoring the campsites enveloped in the mid-day torpor of noontime in a summer canyon. Despite the shock of the headless squirrel, there is much to appreciate as we walk the trails. Man has encroached upon nature, but he has done so here with a degree of sensitivity not duplicated in many parts of the world, including my wife’s native China. Our trail walks in the Middle Kingdom betray an improving yet still human-centric thinking about nature. In China, nature bends the knee to man. In Arroyo Sequit Canyon and in most of California, man and nature search for a boundary twixt the two that is viable for both. Standing a hundred feet above the campsite, it disappears. Hundreds are encamped below, but only the occasional shout of a playing child reminds us that we are not the only people in the area. The breeze rustles through the underbrush alongside trails mercifully free of trash, the pathways themselves the only sign of man’s presence, and the plants and birds a reminder that the very existence of the path remains tenuous. The fauna sleep in the heat of the day, a heat barely broken by shade that seems to radiate from the hillside itself. We round a corner in the trail, and suddenly the temperature drops five degrees, the breeze cools, and the heaving blue Pacific shows itself at the mouth of the canyon. At once the word “microclimate” jumps to mind, and we pause to discuss quietly what we have just experienced. We follow the trail back down to the small but superb interpretive center, and sit down quietly, unwilling to break the unexpected spell the day has put upon us. via 10 Nora Ephron quotes that will inspire anyone | Articles | Home. 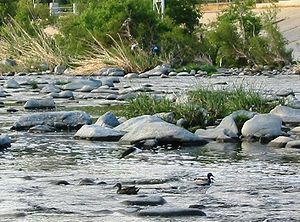 Militant Angeleno: North Atwater Park: Up Close and Personal with the Los Angeles River. I tend to focus on human history in the GWR, but The Militant Angeleno reminds us that there are slathers of natural history that, once thought lost, are now coming back to California in a manner reminiscent of the preservation of some of our finer historic districts. Specifically in North Atwater Park, The Militant Angeleno offers and example of how the Los Angeles River, long reduced to a soulless concrete ditch in the honorable name of flood control, is now being restored to something quite remarkable: a natural watershed, habitat, and ecosystem that does not lose its ability to serve as a channel for storm waters. The photos are stunning, and call to mind similar “remediation” efforts that will take place in different parts of the state (the Matilija Dam Ecosystem Restoration Project in Ventura County comes to mind). It can be done right, and North Atwater Park will serve as a case study. In another of his installments on walking L.A.’s more storied avenues, L.A. Times architecture critic Christopher Hawthorne offers the perspective on Los Angeles’ future he gained by walking Sunset Boulevard the other way – i.e., from the beach to East L.A.
Hawthorne offers us echoes of familiar critiques Los Angeles, noting the disappearing sidewalks and three-story-tall hedges that line the winding street on the West side; the disappearance of Hollywood the industry from Hollywood the place; and the general sense of decay that pervades the Boulevard and its environs from the Beach to downtown. But the columnist really hits his stride when he suggests that in the once-Jewish now-Latino shtetl of Boyle Heights we find hope for the future of Southern California. In the area along what is now known as Caesar Chavez Boulevard, Hawthorne suggests he has found the answer to Los Angeles’ unspoken challenges in a neighborhood unified by culture where the automobile is relegated to long trips and people actually walk places. He offers a similar treatment to Sunset Triangle Plaza, a block-long street cordoned off to traffic and re-landscaped for pedestrians as an experiment in neighborhood planning. Such experiences are an enticing vision, but one is left with the feeling that the future of Los Angeles is somehow wrapped up in making it more like New York City. Whether you agree with that approach or not, Hawthorne does a great service by offering us more than a pedestrian’s travelogue, having the temerity to leap off the front page of our Sunday paper, rip our sunglasses off, and demand that we go looking for the seeds of L.A.’s next germination. Yet I finished the article feeling like Hawthorne had more to say – or that maybe I wanted him to have more to say. Indeed, my most serious critique of the article was that it should have been about three times as long. I’ve driven the length of Sunset myself a hundred times, and the omissions leap out. Music merits barely a mention, but the Los Angeles music industry is probably more vibrant even than New York’s and Sunset is thrumming with that rhythm. (New York’s music scene and its importance to the art and the business has been in a long decline, capped by the 2008 closing of CBGBs.) Digital entertainment and advertising shops, most of them small but incredibly creative, are starting to cluster in the area. Healthcare gets a passing mention, without a suggestion that the future of Southern California – given its salubrious climate, superb research and teaching hospitals, and America’s aging Baby Boomers – may be wrapped up in the addressing needs of the aging. And as important as car-less transportation is to Hawthorne’s point, the slow-motion revolution radiating out from the Union Station/Gateway Plaza complex deserves at least a mention. I suspect the problem was space, as it is with most dead-tree journalism. I have to believe Hawthorne wants to say much more. All of us who love California are in search of her future, and few people have the training and the gift of communication that Hawthorne has to be able to offer us some vision of what that future should our could look like. Hopefully Hawthorne is already thinking about a book on this subject: I would imagine he has much more to offer us on this theme than what the editors of the Times allowed him. In the face of the growing (and badly understood) phenomenon of colony collapse disorder that threatens the nation’s food supply, a Los Angeles couple has started a movement to compliment urban farming: urban beekeeping. Steve Lopez delivers a delightful profile of the pair in today’s Sunday L.A. Times. While beekeeping is illegal in the City of Los Angeles, Therese McLaughlin and Adam Novicki have watched their garden “explode” after adding a single colony of honeybees. They were so moved by the experience that they have started a non-profit organization, HoneyLove (http://www.honeylove.org) to get more of us urban dwellers into the bee business, and to get city ordinances preventing the farming of bees either modified or repealed. The story strikes a chord for several reasons. First, most people forget that California is at its core an agricultural state. Long before the arrival of oilmen, aviators, and filmmakers, the sunshine and sea breezes had already turned California into the most important agricultural state in the Union. Despite technology, urbanization, and modernization, California now supplies the world. Second, I think Mc Laughlin and Novicki (trading as “T&A Farms”) are onto something, fostering a trend that is liable to spread across the nation, and adding another brick to the construction of the California of the 21st Century.